Official says finding kidnapped teens is the primary target, Shalit deal re-arrests will prompt major changes for Hamas. The IDF searched 120 more homes in the Hevron area for abducted teens Naftali Frenkel (16), Gilad Sha'ar (16), and Eyal Yifrah (19) overnight Monday, bringing the total number of buildings searched so far to 1,800. "The main effort is finding the boys, and we do everything with this in mind," a senior IDF official stated to Arutz Sheva Tuesday morning. "We will rest our troops, substitute part of the brigade with more staff from headquarters, and provide forces with a chance to regroup," he added. 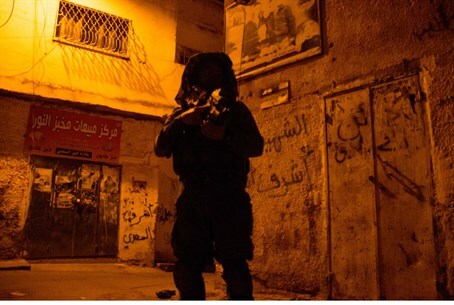 The IDF official emphasized that eradicating Hamas in Judea and Samaria is the second goal in the operation, dubbed Brothers' Keeper, and that the third is strengthening protection for Judea-Samaria residents to ensure their safety in everyday life. Over 360 terrorists have been arrested since the operation began twelve days ago; of these, over 50 are terrorists released in the 2011 Gilad Shalit deal (14-15%). The IDF official referred to the high percentage of Shalit re-arrests, predicting that the operation could make waves for both Israel and Hamas. "By the end of the week, we will see the fruit of the Shalit deal," he said, mentioning that the terrorists would "return to prison for decades." "Hamas never thought it would happen like this and I am sure it will change the status quo," he added.